The Drive Medical Bath Stool with Padded Rotating Seat reduces twisting and reaching while in the shower, ensuring users safety and comfort. 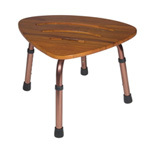 This Bath Stool is ideal for individuals who have balance and mobility issues. The rotating top of the seat can be removed for easy cleaning, and it comes with a removable tray for storing personal items. The seat height can be adjusted from 16.14 in to 22.8 in and holds a weight capacity of 300 lbs. - The rotating padded seat reduces twisting and reaching while in the shower. - The rotating top of the seat can be removed for easy cleaning. - Comes with removable tray for storing personal items. - Ideal for individuals who have balance or mobility issues. - Seat Height can be adjusted from 16 in to 23 in.